The 1,400- acre (567- hectare) Franklin Farms parcel near Holly Ridge in northeastern Louisiana boasts I- 20 access, dual rail and three universities nearby. Click to view the 2007 Super Sites III chart. here's a parcel of land in Fithian, Ill., that from the air looks like a giant key. Technically, it encompasses 1,192.43 acres (482.5 hectares). It's 15 minutes from Danville, 15 minutes from the huge campus of the University of Illinois in Champaign- Urbana and immediately adjacent to I- 74. But its economic heft could far exceed its measurements if a corporate large- site seeker chooses it for a large investment. The Fithian site didn't fit the lock belonging to Honda, which had looked at the parcel as a finalist before eventually choosing Greensburg, Ind. But that hasn't diminished its potential. If anything – as numerous successes by bridesmaid sites have shown in recent years – it increases the chances for a big announcement down the road. "I've been doing this for 25 years here, and in 2006 we've seen projects requiring 1,000 or more acres come through here six times," says Vicki Haugen, president and CEO of Vermilion Advantage. That's highly unusual, she says, but it gets even more so: Not only did the other five of those queries come before the Honda hunt, but "to my knowledge, the Honda project was the only automotive- related query," she says. While unable to share more detail than that about the code- named corporates circulating the nation, Haugen says transportation and high- tech manufacturing with a large engineering component have been the targets. However, when asked if a logistics park might be acceptable on the Fithian parcel, Haugen says, "Absolutely." All of the above uses would be confluent with a few of the site's other attributes: options on enough land to bring the total to 2,000 acres (810 hectares); two 138- kv power lines; two main transmission metro gas mains; and the all- important two railroad companies, CSX and Norfolk Southern. In fact, the only thing that comes in at less than a pair also makes corporate eyes light up: a single owner. You can see that owner's homestead when you look down from above – there it is, right where you turn the key. The U.S. is now replete with various site certification programs for parcels of all sizes, in order to present as ready a package as possible to that fly- in prospect. There are a few programs for large sites too, notably McCallum Sweeney's Automotive Megasite Certification program, conducted for Tennessee Valley Authority, and Entergy Arkansas' Select Site program. In fact, there's one 1,175- acre (476- hectare) parcel in Grenada, Miss., that's split in two by the TVA/Entergy territorial line. It fit some of McCallum Sweeney's criteria, but has a few drawbacks: a low labor draw, a transcontinental gas line and a wetland among them. Those are the kinds of things that an independent, third- party program can ferret out, says Bill Adams, target market specialist for TVA Economic Development. "Decision times are getting tighter and tighter," he says of client needs. "There's no time to initiate land negotiations – there's a time risk, and PR risk. Companies are looking for the path of least resistance, so you have to have the product available when they need it." "Companies are looking for the path of least resistance, so you have to have the product available when they need it." their window of time is fairly finite." David Hutchinson, director of recruitment for the Alabama Development Office, says, "I've been at ADO for 18- plus years and don't recall ever being asked for a list of 'certified sites.' Sites listed on the EDPA Web site by Alabama communities are, for the most part, publicly owned with either a full array of utilities or the ability to get the required utilities to the site in a timely manner. A large number of the sites have had some basic geo- technical work performed as well as a Phase 1 Environmental Assessment and in some cases a wetlands delineation. Sites submitted either to consultants or company representatives are based on the criteria submitted. I don't recall ever once having to tell someone 'We don't have any sites that meet your minimum requirements.' "
Indeed, many sites may not need programs by virtue of good internal due diligence processes in the community. But the problems arise when there's simply a site listed for sale, says TVA's Adams, because "funny things happen when a project comes around." The differentiator, he says, is how much homework is done, from geotechnical analysis to possibly threatened endangered species or cultural resources. 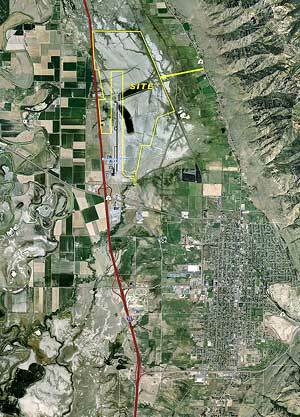 The unzoned Fuller Property in Brigham City, Utah, includes an airport and I- 15 on its boundaries. And then there's the speed factor: "Most of these plants, once they make a decision, want to be turning dirt immediately," Adams says. The TVA program's third and final phase wound down with the end of 2006 with one more site, the Clarksville- Montgomery County site in Tennessee, achieving certification in mid- December. Since its launch in March 2004, the program has reviewed 40 sites and certified only eight of them. While there is no certification program per se in Illinois, Vicki Haugen does commend the programmatic and community certifications performed by Ameren unit Illinois Power. And she notes how some may choose the road less traveled by. Indeed, as attested in these pages by Indiana Gov. Mitch Daniels with regard to the selfsame Honda project that looked at Fithian, some companies really don't want everything and the kitchen sink. "We have the enterprise zone program, and we know that site could be encompassed if that were a perk necessary to finalize a deal," says Haugen. "But with global clients, not every client of that magnitude wants to have a potentially burdensome impact on local tax rolls." But it's in the back pocket, just in case. Somewhere out there in TVA territory, 32 "almosts" are in the back pockets of economic developers, still possessing enough to tantalize certain prospects. Others are just entering the fray. In Augusta, Ga., it's the 1,700- acre (688- hectare) Augusta Corporate Park (ACP). Late in 2005, the Board of Directors of the Development Authority of Richmond County agreed with the staff to market the ACP as a "mega- site" to very large companies. Among factors leading to the decision were the facts that small to medium size companies desire a closer proximity to an Interstate highway, and the relative paucity of such mega- sites in the state of Georgia. Looking to buy up some farmland for your next plant site or megasite? The U.S. Dept. of Agriculture reports that in 2005 the value of U.S. farmland increased by 16.3 percent. 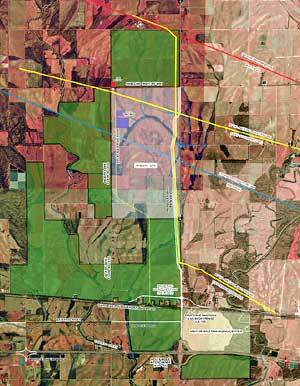 for development on an overall parcel of 11,000 acres (4,452 hectares). The only caveat? It's the wastewater treatment facility. According to the site's marketing plan, because of "unique waste treatment capacities, ideal opportunities exist in alternative energy (bio- diesel), taking advantage of available hauled brown and yellow grease. (A) target study recommends large dairy, farming, or greenhouse operation, and sustainable development and research centers." Lest one turn up one's nose at such an opportunity, a glance toward Alabama may be helpful: Part of the due diligence conducted by CH2M Hill for Jenkins Brick's new $56- million brick manufacturing facility, the largest in the world, was site suitability for landfill methane use. The firm evaluated 301 landfills in its Landfill Methane Outreach Program, came up with 13 finalists, and picked the Star Ridge Landfill in Moody, Ala.
"Using landfill gas will satisfy 40 percent of the plant's initial energy needs; this percentage will increase to 100 percent over the next 10 years as the landfill grows," said CH2M Hill. There may be more super sites than anyone had previously imagined.